One of the most interesting ways to discover Kea is by walking. The well-preserved network of footpaths in the island includes 12 routes that will offer you unforgettable experiences. Wander around the green creeks in the inland, the most isolated small bays, the most picturesque chapels, the imposing ruins of an ancient tower. Check out the suggested routes and let Kea reveal to you its natural beauty and its enchanting history. Kea is a paradise for the walkers as it has a footpath network of a total length of 81 km, many of which are stone-paved. The footpaths were part of an ancient road network that in the 7th – 6th century B.C. connected the cities-states. In every path you will find wooden signs with practical information about each route and small metal sings indicating the number of each path. Put on comfortable clothes and shoes, take supplies and let the island reveal to you its secret beauty. Length: 5.100 m. You start from Ioulis following the sign with the indication ”Leon”. Passing through the “stegadia”, the typical Cycladic galleries, you will make your first stop to the famous Lion of Kea, a rock with a sculpture in the shape of an imposing lion that, sunk into bliss, is gazing towards Ioulis. The Lion dates back in the archaic years and the legends around him are many. Moving further to the path, you will find Benjamin ‘s spring accompanied by a centenarian sycamore. There you can quench your thirst with pouring water and rest under the sycamore’ shadow enjoying the enchanting view. Then take the road to Dossonari, walking through the oaks and the almond trees. After a while, you will meet the first houses of Otzias and if you cross Diaselli, you will end up to the beach in Otzias bay. Length: 3.100 m. Starting from the famous spring of Rokomenos at the exit of Ioulis, where according to the legend whoever drinks its water will marry someone from Kea, you go down to Korissia. After 1.800 m., you meet the church of Aghios Konstantinos and the homonym spring. Here starts a cobbled path that lays over the remains of the ancient road Ioulis-Korissia and crosses the valley of the watermills, where the water of Flea, the rich spring of Kea, flows. From Mylopotamos you may take the central road that after 2 km ends up to Korissia. It’s better, however, to go on walking through cypress-flooded creek in the area of Flea. Along the river, there are still preserved 11 grinding watermills, typical samples of the Kean architecture in total harmony with the environment. In the past, they functioned all year round along with the windmills grinding cereals and suppling with flour and animal food the villages. Today most of them are abandoned while a few of them are inhabited. Length: 11.850 m. This route connecting ancient Ioulis to ancient Karthaia runs the inland of Kea. It is intersected with the road network with which it meets in four different spots. You may walk it from the beginning following the signs but you also have the opportunity to wander around some of its parts as small complete routes. The starting point is Ioulis. Climbing up the stone path from the square, you reach the Aghia Trias spring. After the first crossroad with the village road, the path goes on to the old windmills, that are a representative samples of the local folk architecture. You meet again the village road after the old mill and you continue to the path that leads to Messaria and its beautiful spring. In Gyristi you will go out again to the village road, continuing to the path of Profitis Ilias that leads to the highest spot of the island. The entire route is stone-paved and passes through the oak woods. After Profitis Ilias you go out to the village road in Astra area. From there you will walk for a 1.700 m. distance on the asphalt road until Ellinika area where a wooden sign shows you the way to the path that ends up to the archeological site and the coast of Karthaia. From Ellinika as well as from Aghios Symeon you may also take the alternative route 8 with destination Aghios Filippos. Length: 4.450 m. From Ioulis you take the village road to the east areas of Kea. From the village road Ellinika-Katomeria, in the location Gyristi, you take the dirt road that will lead you to a significant byzantine monument: the Episkopi monastery. Many of the church’ s spots are built with ancient building material. From here you will start your tour. First stop: Sotira and its spring. The area is full of oak trees, so you will cross a part of one of Kea’ s oak forests and at the same time one of the last forests of Royal Oak left in the Aegean Sea. Next stop: the location Tria Maderika. Here the landscape starts getting more rocky. You will walk on a rough slope but at the end you will get rewarded by the beautiful sandy beach of Sykamia where it ends. You may start the same route also from Sotira to which the next dirt road leads you. Length: 3.150 m. The village of Kato Meria is located in an area with great natural beauty in the heart of Kea and this route is connected with the broader archeological site of Karthaia. Reaching the location Kalodouka, you will find the homonym spring, where until today survive the ancient leveled surfaces of cultivations. The Kalodouka and Vathypotamos springs that you will meet further are the most ancient water supply resources of Karthaia. This route can be connected with route 3, in location Chimoniki. From there, a partially stone-paved path will lead you to Atzeritis in Kato Meria, an alternative route to access Karthaia, through the inland of the island. Length: 2.300 m. This tour has village Stavroudaki as starting point, at 17 km distance from Ioulis. After approximately 400 m of dirt road, you will meet a stone-paved path. At that point, you leave contemporary Kea and you start sinking in one of the most important natural and historic landscapes in Cyclades. While you move further to the ancient path that crosses Vathypotamos, you will see the entire flora and fauna of the island gradually being revealed in front of you. This is the area where the theater and the water supply system of the ancient town were discovered. At the end of this route, you will see Panagia ton Polo sprawling. After you take a swim in its deep blue waters, you may start your exploration. In the south end of Aspri Vigla you will find the acropolis of Karthaia, with the most important buildings of the ancient town: the temple of Athena and the temple of Apollo. Two more buildings, “propylon” and “building D”, are located around the temple of Athena. On the east side of the acropolis, there is the cemetery of the town. In the whole site there are currently being conducted excavations and works of preservation. 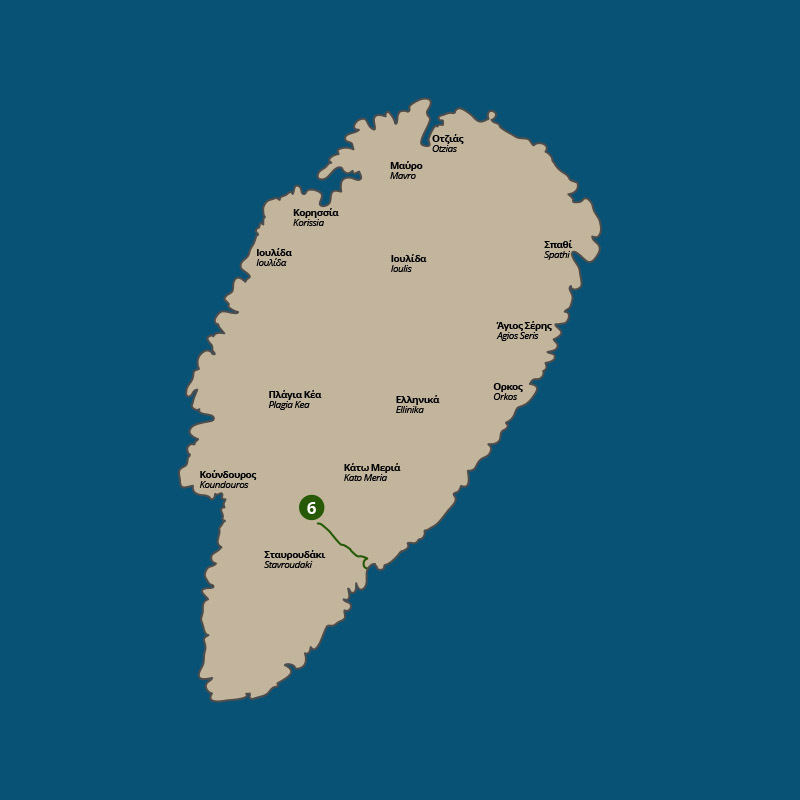 Length: 1.700 m. The traditional village Chavouna is at a 18,5 km distance from Ioulida. Chavouna belonged to ancient Karthaia and until today has undergone minimal interventions. After going down the cobbled path and having always view to the sea, you meet the little church of Aghios Taxiarchis. In location Pigadaki you have the chance to see signs of a farm of the classical era, with a precinct and towers. After about half an hour you will find yourselves in front of a deviation. If you move into the main road, you will end up to Vathypotamos stream, where the route is connected with the previous ones. If you follow the deviation, you will reach the isolated beach of Kaliskia. Length: 4.300 m. Starting point for this route is Ellinika, at a 10,3 km distance from Ioulis. If you start from Aghios Symeon, the route towards Aghios Filippos is shorter. From Aghios Symeon you may also choose to follow route 3 towards Karthaia. After Ellinika, in location Chouchli, survives a part of an ancient tower that was used as an observatory for the control of the area. When you reach Vryses, you will see the stone-made constructions used for watering the cultivations. The route ends up to the isolated pebbled beach of Aghios Filippos. Length: 5.500 m. This route through a green landscape starts from the south fringes of Ioulis, in location Synetairismos, and goes up to the Mountain of the Mills, at a 500 m. altitude. Walking further for quite a while on the village road, you will find in the area of Tholos the historic temple of Ioannis Theologitis and then you will enter the dense oak forest of Kalogerados. You will cross a creek of unique wild beauty and you will reach at the clearing with the church of Aghios Nikolaos, a point where the route may split into two smaller parts, because of a road passage. The path continues always through a virgin oak forest in Amarathia and, just before it ends up to Ellinika, it turns again to a track. 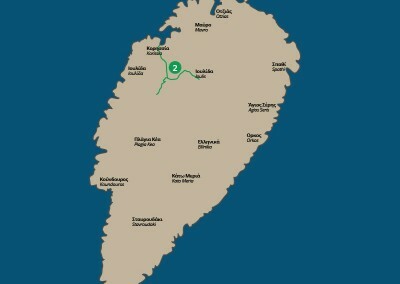 This route is connected with Ellinika with route 3 that leads to Karthaia. On the opposite direction, to the west, you may expand your route towards the post-byzantine monastery of Aghios Panteleimonas and Aghia Irini, having as final destination Panagia Loutriani, in the depths of a forest valley, where you will see one more ancient tower and other buildings of the same era. Length: 4.800 m. Following initially the same route of exit from Ioulis with the one that leads to Otzias (Route 1), you reach Benjamin’ s spring. This location functions as the starting point of the route because it has also a road access from the village road, leading from Ioulis to Spathi and Kastri. After the spring the path ramifies and its east branch leads to Aghios Dimitrios. Following for a 150 m distance the village road, you will meet a sign that will get you again into the path. You go down to the deep creek of Spathi, the most impressive one in the island. The biggest part of this route is shadowy. Getting close to the bank of the stream, you may observe the terraced stone road with continuous angular turns that is a unique sample of the rural folk architecture of Kea. After a tour through the stream and the dense vegetation, passing from dispersed country houses and chapels on the slopes, you end up to the big idyllic sandy beach of Spathi, where you have the chance to swim in the crystal waters or just to rest in the fish-tavern. On the southern hill next to the beach there has been discovered an ancient mine. Length: 5.500 m.“Poiiessa” Route: Katomeria – Chionatos spring – Pisses – Pisses beach Length: 4.700 m. In location Sklavonikolas, you turn right from the village road and you take the track to Vroskopos. After 1,5 km, you meet on your left the entrance to the path Panachra-Aghia Marina. Very soon you reach to the abandoned, yet quite impressive ancient Hellenistic Tower of Panachra. If you continue to the same path, you will reach to a biggest tower, the Tower of Aghia Marina, that dates back to the Classical-Hellenistic years and still stands there resisting to the corrosion by the centuries, the earthquakes, the invasions and the hurricanes. Next to it you will find the snowy little catholic church of Aghia Marina that belonged to the early Byzantine monastery. At a short distance, you will meet the homonym spring known for the best running water in the island. Leaving behind you the Tower, you will go on through a narrow village road that after a while, in location Kremasti, turns into a descending path towards Pisses. In this amazing route, you will enjoy wild nature’ s beauty, walking through the rocky mountainside and gazing across the picturesque area Plagia that ends up to the creek. After your descent to Pisses valley, you will get rewarded with the view of a serene landscape with fields, fruit trees and farms. What you will most enjoy though is swimming in Pisses beach and enjoying its velvet sand. You may reach the same destination starting from Aghios Nikolaos in Kato Meria and following that wonderful route full of dense vegetation and beautiful landscapes. After you pass Chionatos spring, you will end up to the big creek and then to Pisses beach. This alternative route is connected with the previous one in the big creek, at a 2 km distance from the beach. Length: 4.200 m. “Orkos” Route: Velado – Grikou – Gerantoni Spring – Panagia tou Grikou Length: 1.900 m. A route that was recently characterized as a “Route of Cultural interest”, starting from Profitis Ilias and ending up to the picturesque bay of Orkos. You may start this route also from Ioulis. In this case, the route until Profitis Ilias is identical with “Aristeos” Route (no. 3). From the village road at the level of Profitis Ilias, the route leads to a narrow track that after a while turns into a path. After transforming in a cobbled track, the route goes down towards a creek full of oaks and maples. At its last part, it leads to the stream, ending up to Orkos, in a beautiful sandy beach with trees, clear waters and a few cottages. Here you will see old iron ores some of which are open to the public. You may return by car through a quite good road. The same route in the broader area Velado – Profitis Ilias may include an idyllic tour that leads from the village road Ioulis- Katomeria to Velado. There you will see little churches, cottages and villas. From the location Grikos, the route goes down to a stone-paved narrow path framed by “xerolithia” walls. Through an oak forest you come down the stairs, pass from Gerantonis spring and end up in the picturesque chapel of Panagia of Grikos.